Within Teamwork Projects, you can manage your board view columns to set them up in a way that works best for your project. You will see the arrow for the menu when you hover over a column outside any cards. Edit - Change the column name and colour. Filter - Show a search filter at the top of the column so you can show only cards that match your search term. Delete - Remove the column from the board - any cards on the column will be returned to the backlog. 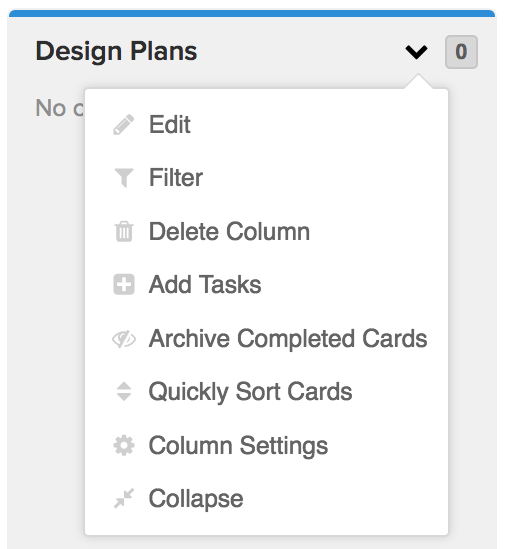 Add tasks - Quickly choose multiple tasks from your project and add them to the column. Archive completed cards - Hide any cards that have been marked as complete from the board (you'll find the option to show archived cards under the main board options menu in the top right of the screen). Sort cards - Sort cards currently in the column by name, priority or date created. This sorts the cards but allows you to manually update their order by dragging them. Column settings - Access more options for setting an automatic sort on the column, and choosing details to show on cards. Collapse - This will minimize the board column to a narrow column with just the column name displayed vertically, giving you more room on screen to work with other columns. 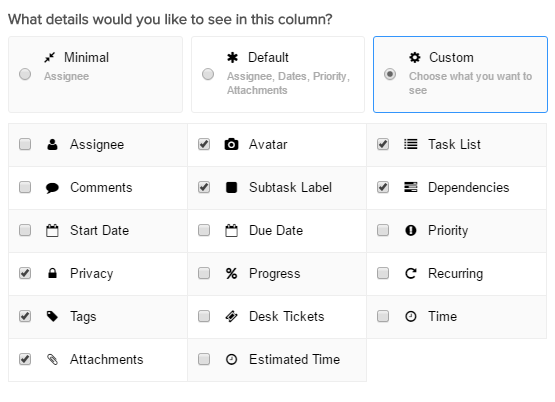 In the column settings, you can select a default task list for the column. 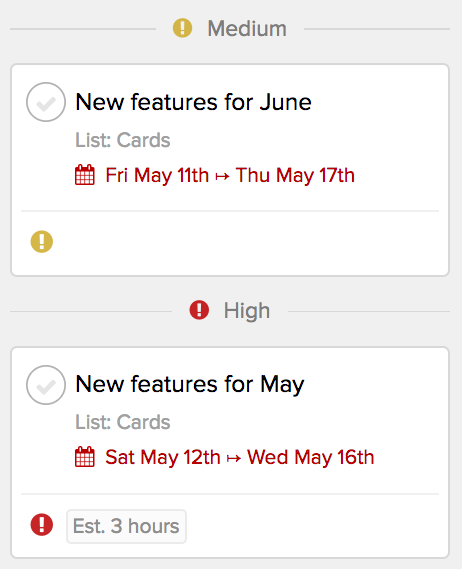 If a default task list is selected, when a new card is added to the board on the current column then the task for that card will be added to the task list you've specified. Likewise, if you add a task to a task list in list view, it will add the task as a card to the corresponding board. You can choose an attribute to automatically sort the cards in a column, and choose the sort order (ascending or descending). When you set automatic sorting on a column, the cards will be grouped by that attribute, in order. You can choose which details you want to show on the cards in your column, by selecting one of the presets or choosing the 'custom' option and selecting the checkbox for individual options in the column settings screen.